These are the yummy results of the culinary experiments conducted by my dear grand daughter with my assistance during her Christmas holidays. 1. Dry roast peanuts till it emanates a pleasant aroma. 2. Cool and then blend with salt till it starts giving out oil. 3. Add olive oil and blend till it becomes a thick paste. 4. 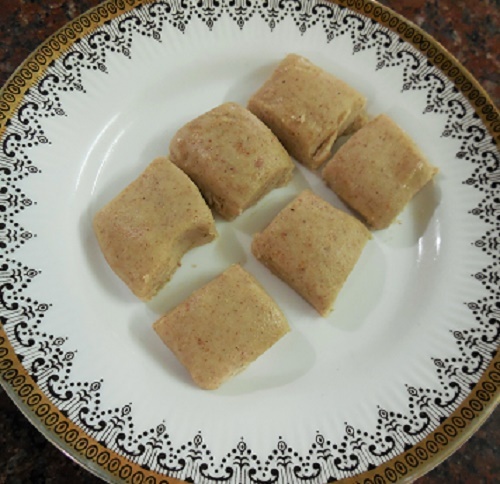 Melt butter and half a cup of the peanut paste together in a microwave oven for a minute and stir the contents well. 5. Mix in the powdered sugar and knead into a dough. 6. Pat the mixture on a greased plate. 7. 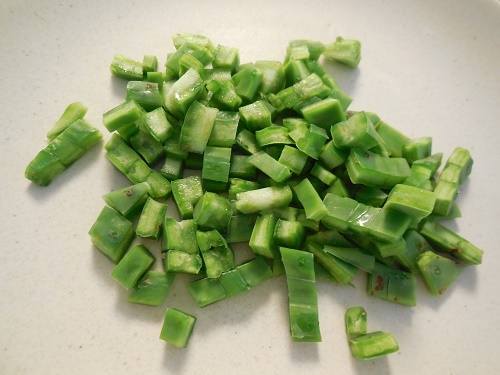 Mark the pieces using a sharp knife so that it is easy to remove them later. 8. Chill the fudge in the refrigerator for an hour till it sets. Cut, eat and enjoy the melt in the mouth Peanut Butter Fudge any time you crave for a sweet. 1. Pressure cook whole Green gram adding 2 cups of water. 2. Place the potatoes in another vessel without water on top of the vessel containing green gram and cook both together until the cooker gives out three whistles. 3. Heat 2 tbsps of oil in a kadai and add 1/2 tsp of cumin seeds. 4. When it splutters add the chopped onion and fry till it becomes golden in colour. 5. Add the chopped capsicum and cook till it wilts. 6. Add the chopped carrots, beans, chayote and peas and saute till the vegetables are almost done. 7. 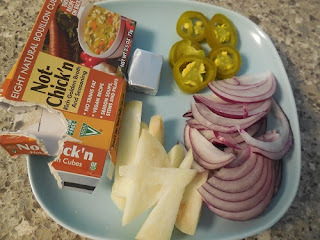 Blend in the salt and sambar powder and cook till dry. 8. Powder the cinnamon, cardamom, cloves, pepper and cumin seeds into a fine powder. Add the peeled garlic cloves and crush them along with the spice powder. 9. 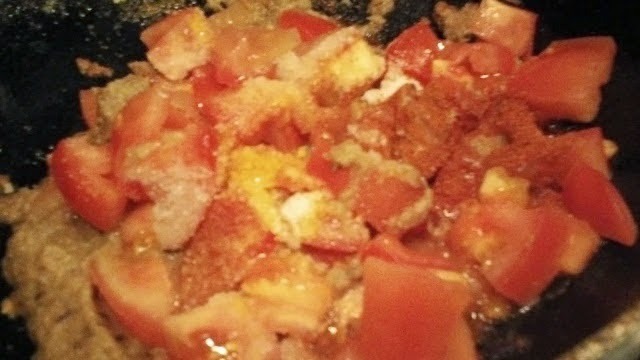 Add the powdered spice powder and the tomatoes to the vegetables, stir well and cook till you get a very pleasant aroma. 10. 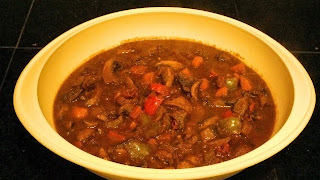 Peel and mash the potatoes along with the cooked green gram and add the mash to the cooked vegetables. 11. Blend the vegetables well and keep the mixture thick. 12. Heat one spoon of oil in a shallow frying pan. (We used the aapa chatti). 13. 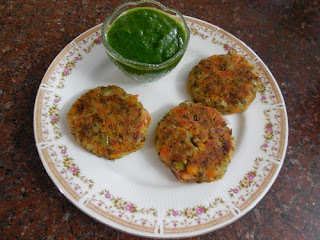 Take a big scoop of the prepared vegetable mash, flatten it like a vada on your palm and place it on the pan. 14. Cook on medium flame till the underneath becomes brown in colour. 15. Gently flip the steak using a spatula and dribble few drops of oil around it. 16. Cook till it becomes golden brown or dark brown on both sides. 17. 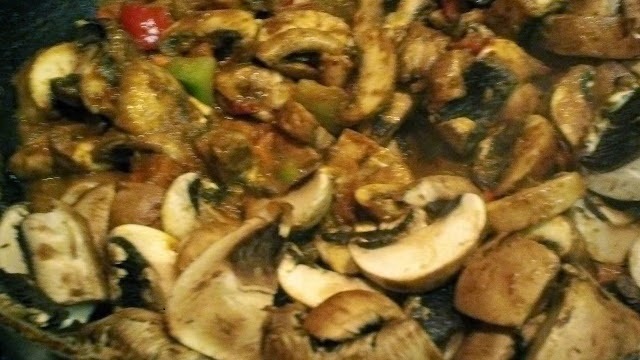 Lift up the frying pan and slide the cooked vegetable steak on to the serving plate. Relish the Vegetable steak with green mint chutney and tomato sauce. 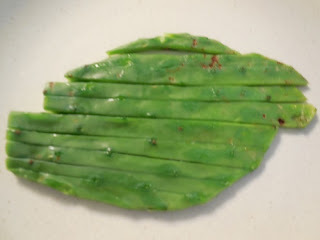 I wondered why a bag of Chappati Kallis / Cactus was sitting in my daughter-in-law's refrigerator along with the other fresh and colourful vegetables! I almost had a panic attack when she said that she intended cooking the Cactus for dinner! I have never seen or heard anyone cook or eat Chappati Kalli in all my sixty five years of existence! I have seen them flourish in waste lands. I have also seen them planted in rows as borders to demarcate agricultural properties in rural areas. But eating the 'kalli' ? It seemed a bit far fetched! I browsed through the internet to make sure of the edibility of the 'thorn' considered to be a vegetable before I made an attempt to eat it. 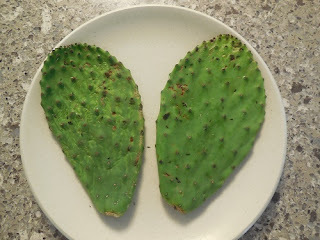 I came to know that the Nopales or the Prickly Pear Cactus or the Chappati Kalli also known as Opuntia is widely cultivated in Mexico and is extensively used in Mexican cuisine. After all the panic and research work, I finally did relish the 'dethorned' and scraped Cactus which my daughter - in - law stir fried with other vegetables. 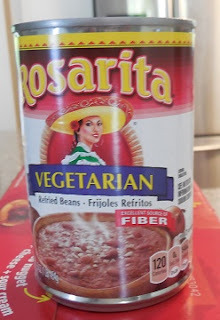 The next time my son guided me in the preparation of a Mexican dish using Cactus and Pinto Beans. It was fun learning to 'tame' the monster with thorns and prepare it for cooking! 1. Carefully hold the nodule at the base of the cactus pad in one hand and scrape out the thorns using a sharp knife. 2. Similarly scrape the thorns on the flip side. 3. Chop and discard the nodule. 4. 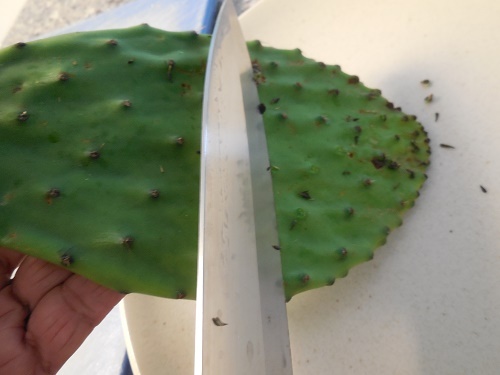 Lay the scraped cactus pad on a cutting board and cut the edges and discard. 5. Make sure that all the prickly thorns are gone and wash the pads thoroughly under running water. 6. 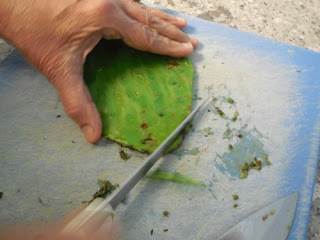 Cut the cactus pads into lengthwise strips. 7. Hold the cut strips together and chop them into small pieces like you would cut green beans. 8. 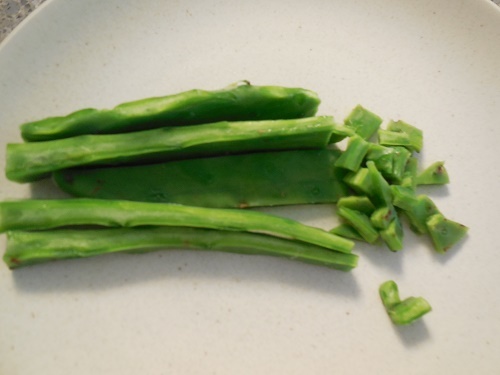 Boil the chopped pieces in 4 cups of water adding a pinch of salt. 9. Cook for 15 minutes until the vegetable becomes soft. 10. Drain the cooked cactus pieces and wash with cold water. This removes the slime in the vegetable. 1. 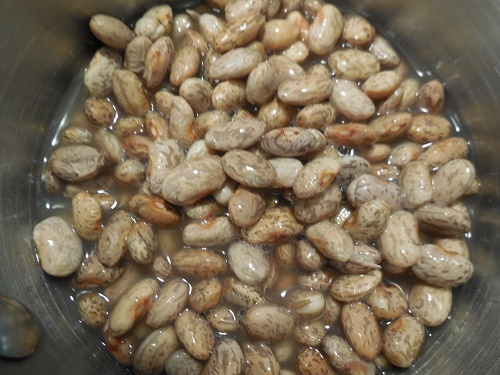 Soak the dry Pinto beans in warm water for 4 hours. 2. 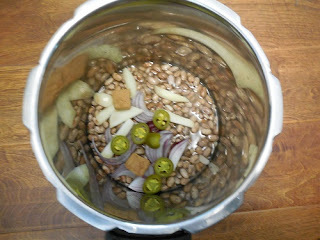 Drain the now softened beans and add 4 cups of water in a pressure cooker. 3. Add the drained beans, chopped onion, garlic, jalapeno peppers and the Vegan Bouillon cube. 4. Pressure cook until two whistles, switch off flame and allow to cool. 5. Stir in the Refried beans and the already cooked cactus to the pressure cooked beans. 6. Add more water if the curry is too thick. 7. Since the fried beans already contain salt additional salt is not needed. 8. Stir well and cook the curry for three or four minutes so that the ingredients blend well. 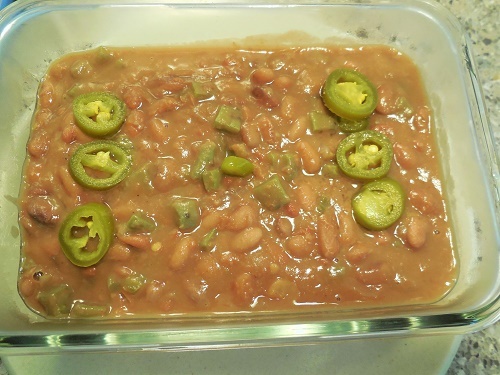 Garnish with more jalapeno pepper slices and enjoy the Mexican Cactus and Pinto Bean Gravy /Kalli Curry with Mexican Red Rice or Rotis.